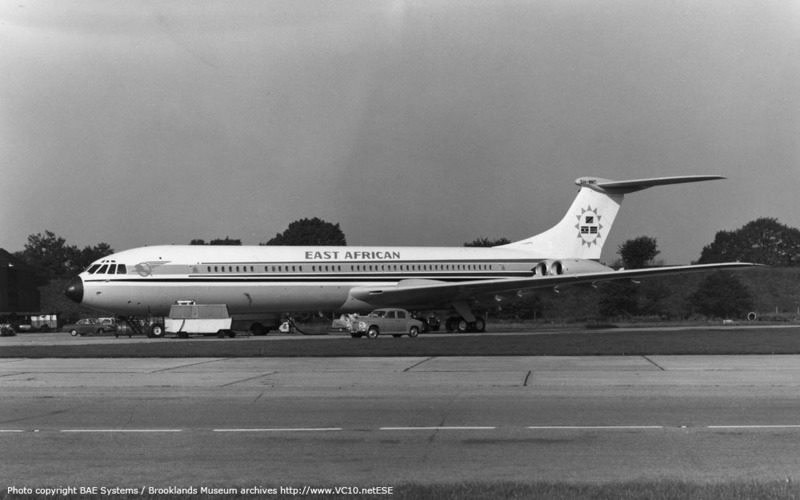 31 October 1966 Delivery to EAA as 5H-MMT, registered in Tanzania. 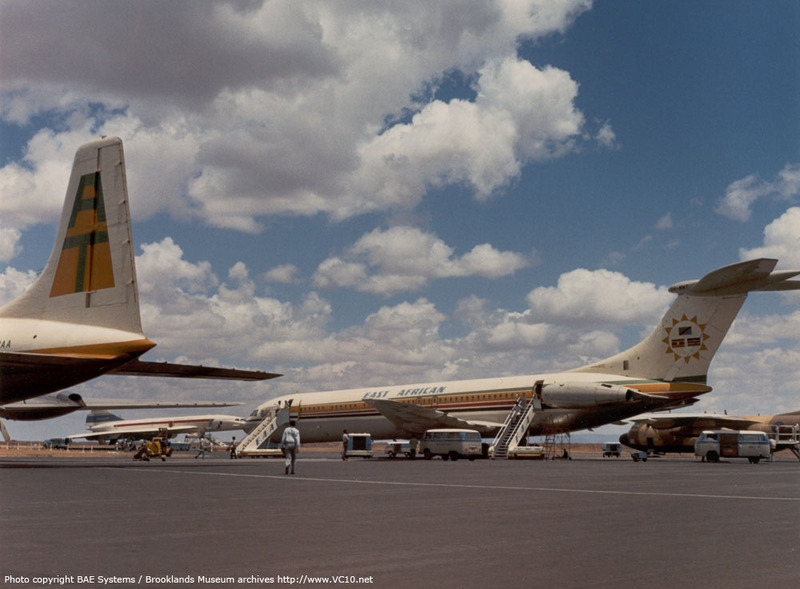 November 1966 Arrival in Nairobi to join 5X-UVA in the EAA fleet. 4 April 1970 Preparing to depart Dar es Salaam for London via Nairobi when word came that President Nyere would like to join the flight. After waiting he turned up with a delegation of fifty and wanted to go to Lagos, not London. After some discussion the flight to Nairobi, with president on board, was carried out. 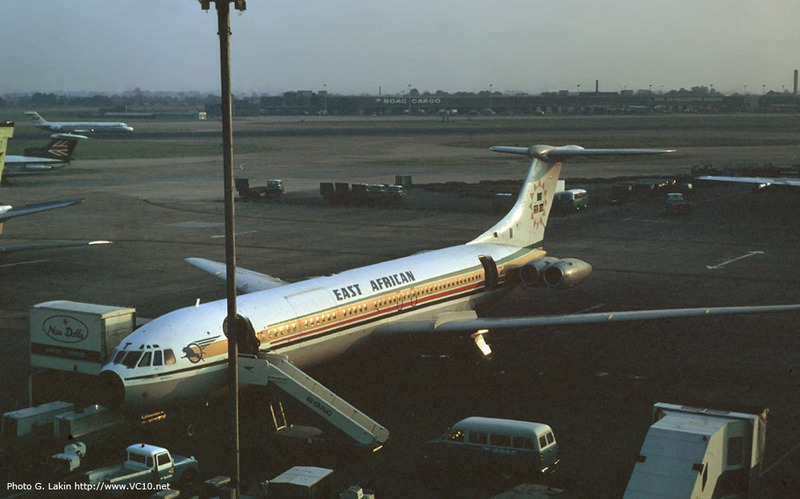 All passengers for that day's EC746 flight to London were eventually transferred onto other flights, the service was canceled. 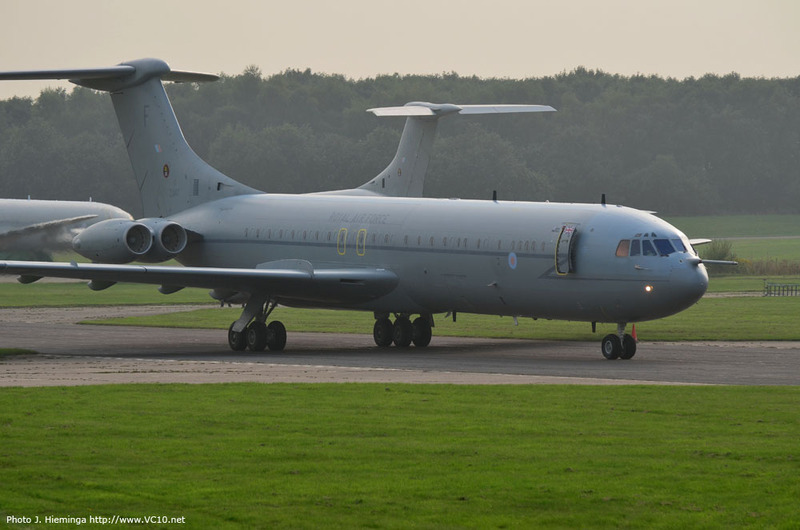 16 May 1977 First VC10 to be flown back to UK, crew: Captain Arthur Ricketts, Co pilot Charlie McVickars, Navigator Claude Scott. 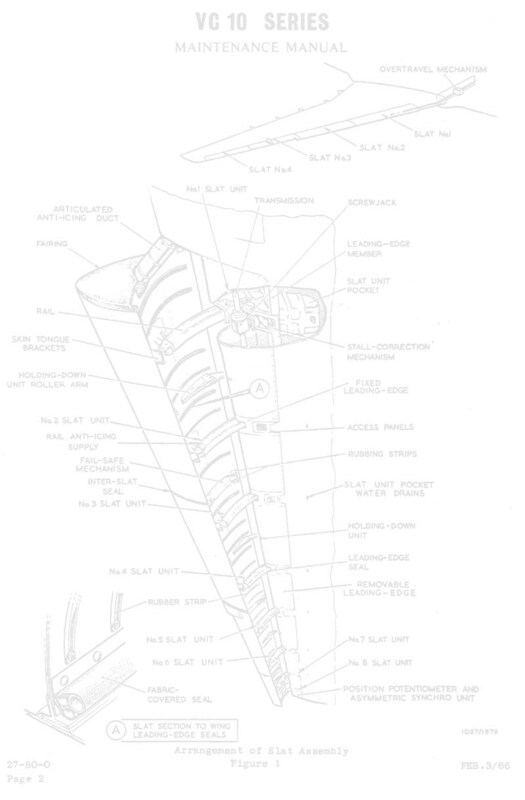 Engineer Paddy Murray was contacted by BAC from Filton just after the 5:30 GMT take off and asked to list all the snags. He was not believed when he stated that only a single warning light was broken. 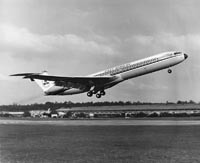 24 and 25 May 1977 Training flights were flown from Filton on these days so that ex-EAA Captain Arthur Ricketts, by special dispensation from the CAA, could renew VC10 type ratings for BAC pilots Eddie MacNamarra (who had joined the first ferry flight as a supernumary) and Brian Trubshaw (now chief Concorde test-pilot). After this the aircraft was stored at Filton in Driclad wrapping. 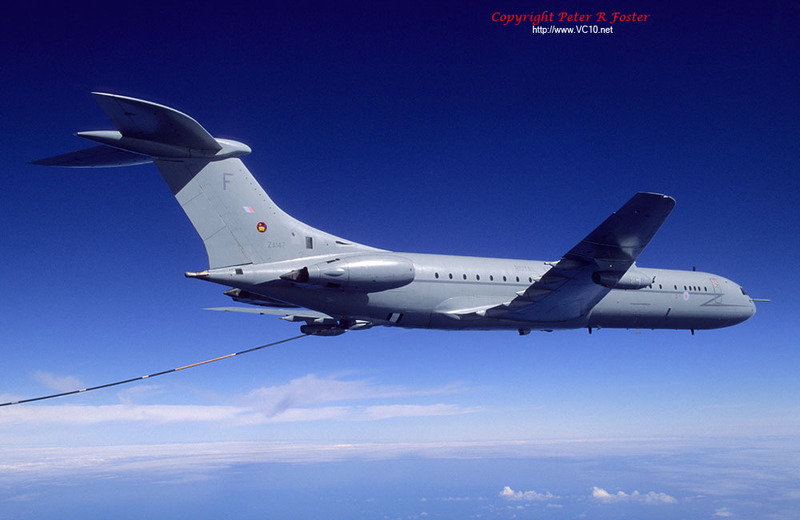 9 August 1985 First flight as a K3 tanker from Filton. 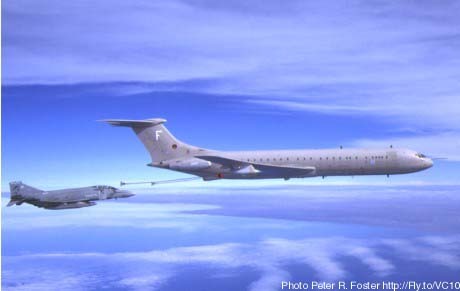 24 September 1985 Delivery to 101 Squadron as ZA147, received code letter 'F' on fin. 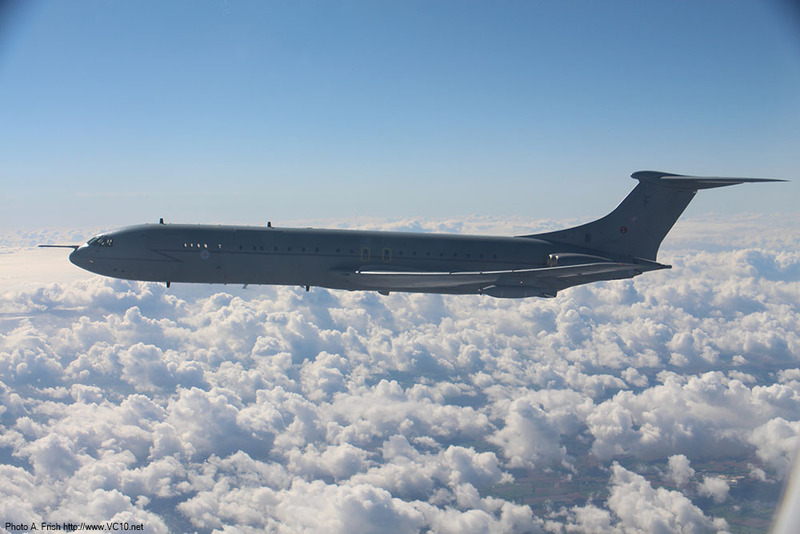 8 April 1987 Broke 101 Sqn's record for fastest non-stop London-Perth flight in fifteen hours and 53 minutes, using two in flight refuellings. Captained by J.L. Upritchard, the record was ratified by the FAI. Click here for the full story on the Airwaysmuseum.com site. 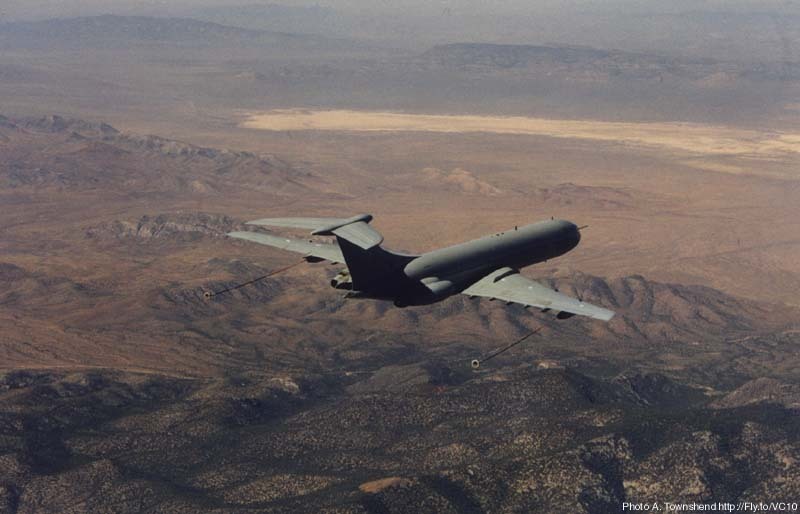 1999 Took part in Red Flag military excercise over Nevada. 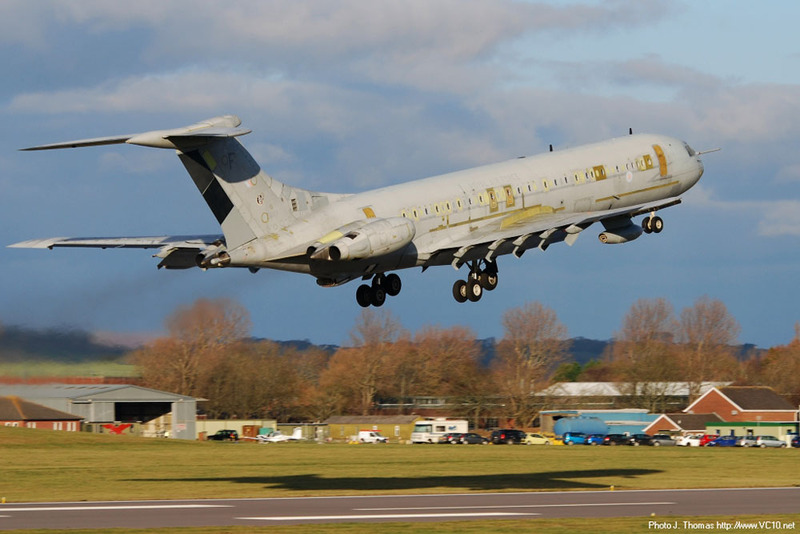 April 2010 Name 'Arthur Scarf VC' transferred to ZA147 due to retirement of XV109. 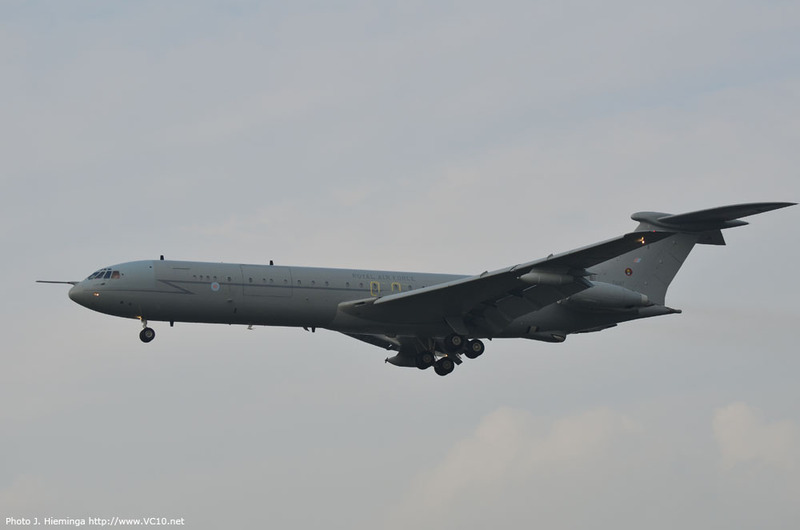 25 November 2010 Departed St. Athan after completion of the last Major servicing of a VC10. 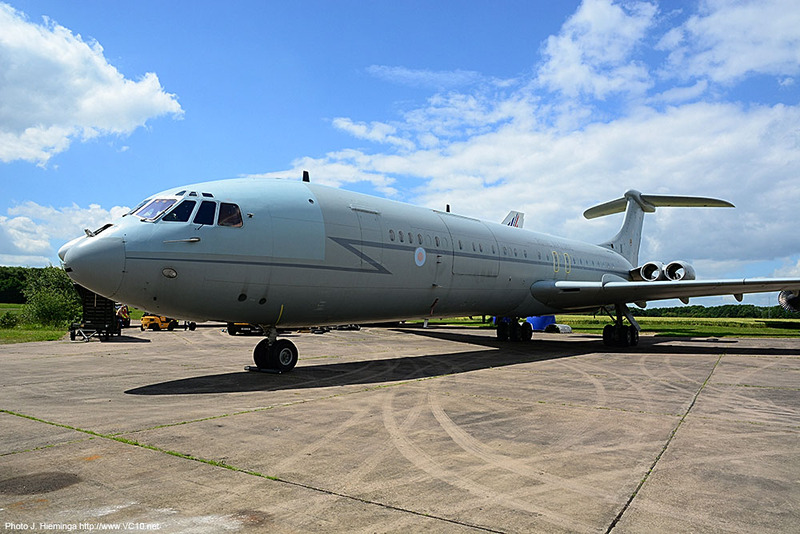 August 2011 Name 'Albert Ball VC' transferred to ZA147 due to retirement of XV105. 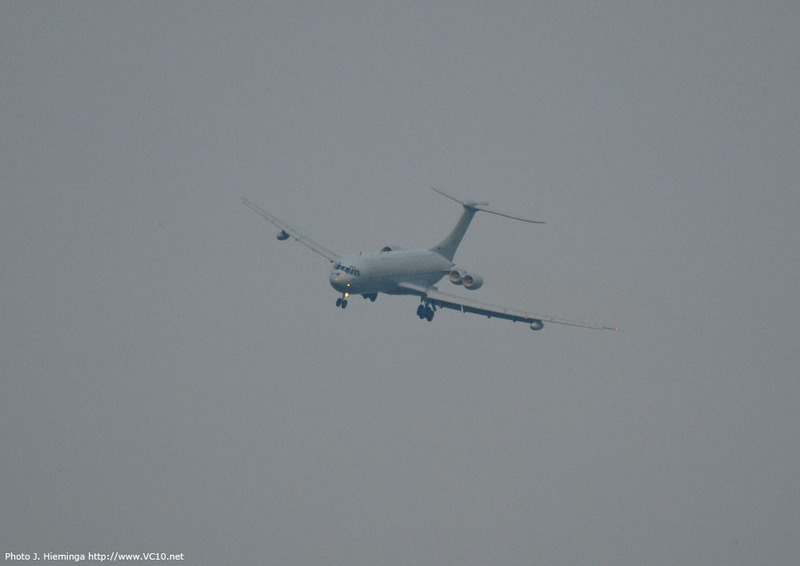 23 February 2012 Left St. Athan at 15:50 after final VC10 maintenance visit to St. Athan (Minor star servicing). 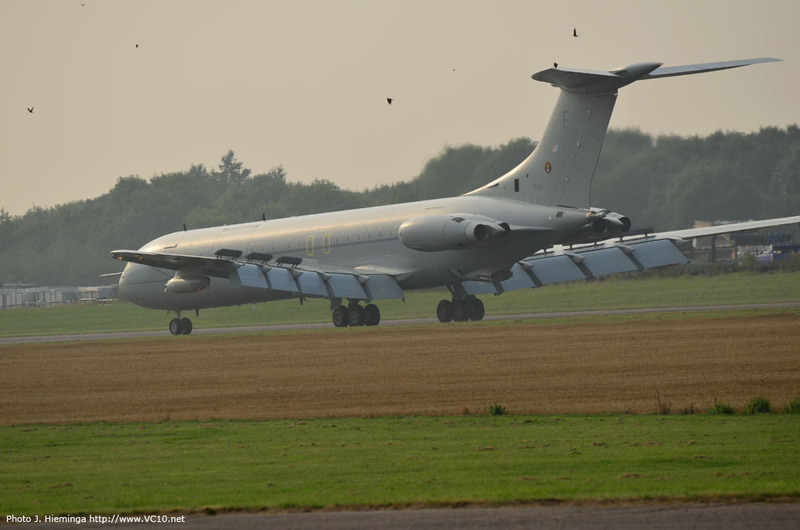 28 August 2012 Formed part of a special three-ship formation that overflew several RAF stations. 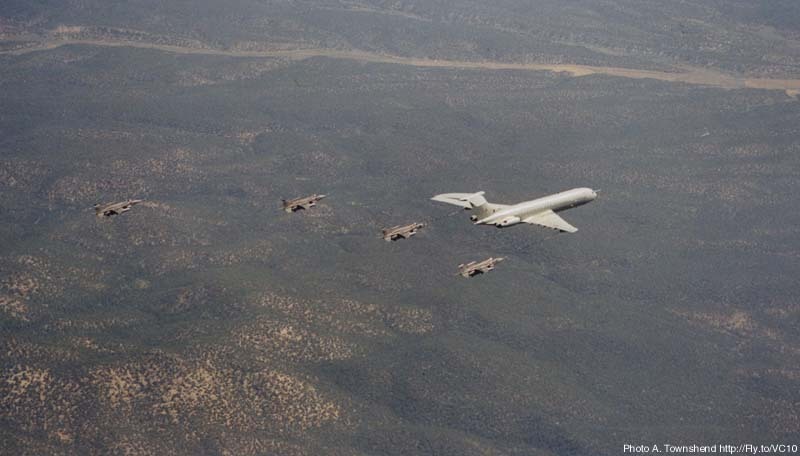 This was the last opportunity to fly the three VC10 variants together but delays in K4 ZD241's maintenance schedule meant that the formation consisted of two C1Ks (XV108 and XR808) and K3 ZA147. September 2012 ZA147 carried a collection of limited edition Mandy Sheperd prints during several flights which were later sold and auctioned for charity. 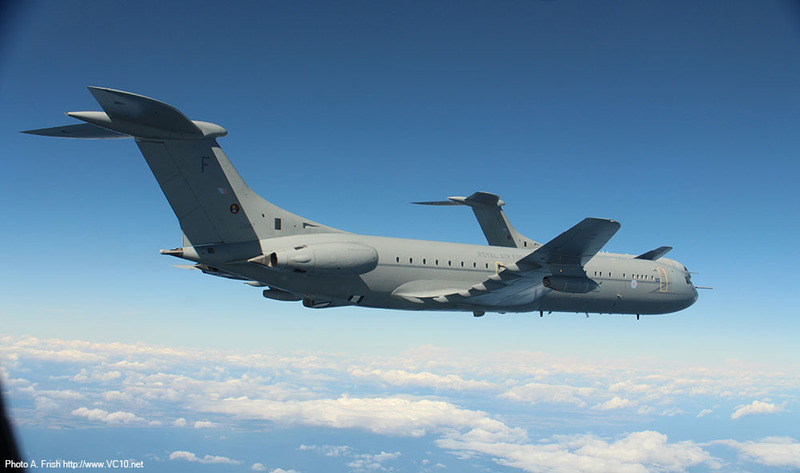 April 2013 Name 'James McCudden VC' transferred to ZA147 due to retirement of ZD241. 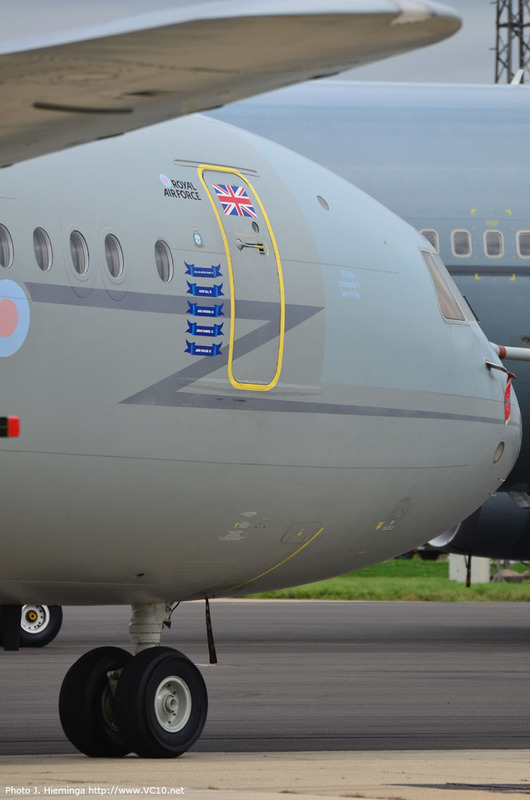 Names 'Edward Mannock VC' and 'James Nicolson VC' transferred to ZA147 due to retirement of ZA149. 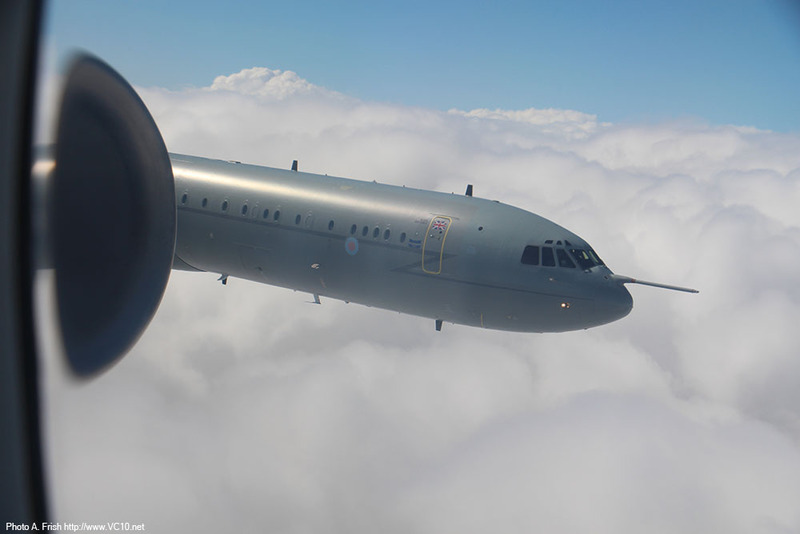 15 June 2013 Flew as element six, together with a 216 Sqn Tristar, in the annual 'Trooping the colour' flypast over Buckingham Palace. 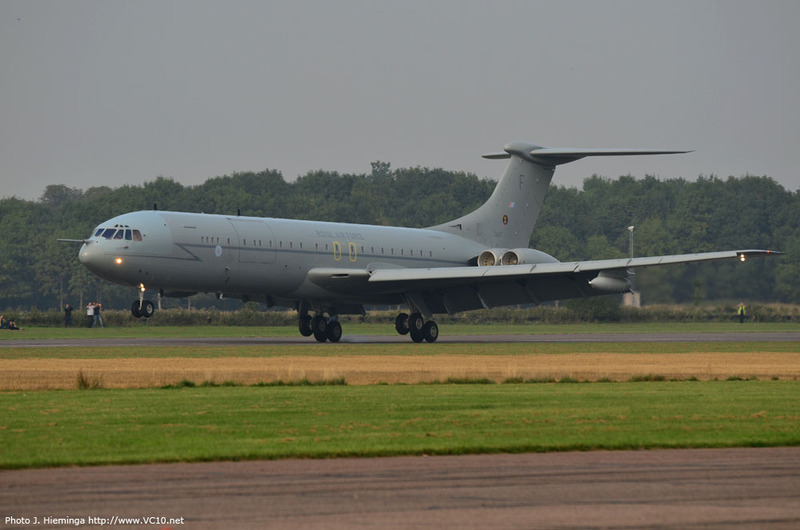 Last time a VC10 has participated in this event. July 2013 242 bottles of Glen Moray single cask whisky were flown on ZA147. These were then sold by Morayvia with proceeds going to the association and the RAF Benevolent Fund. ZA147 burst two tires on landing but the whisky was unharmed. 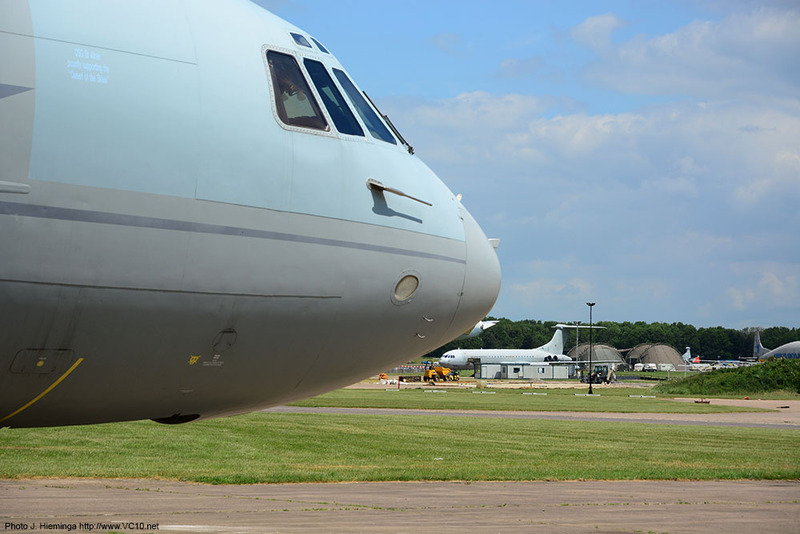 29 July 2013 Left for Mount Pleasant, Falkland Islands for detachment with 1312 flight. 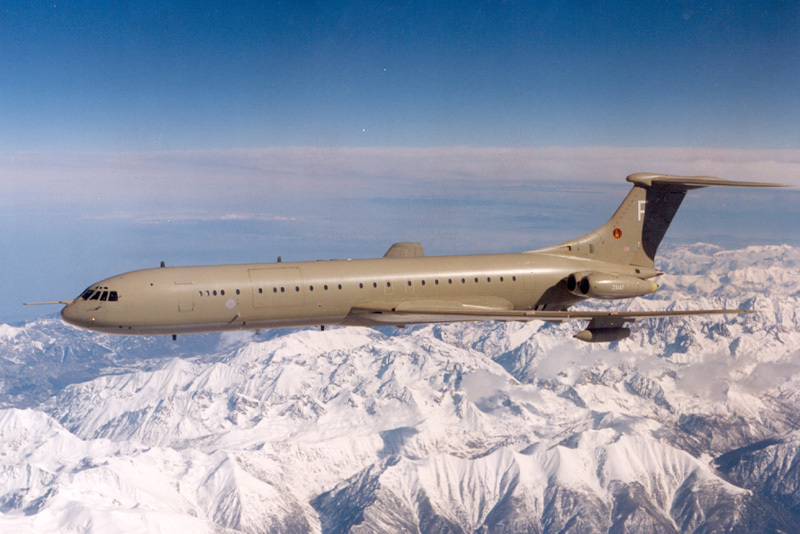 Final VC10 detachment. 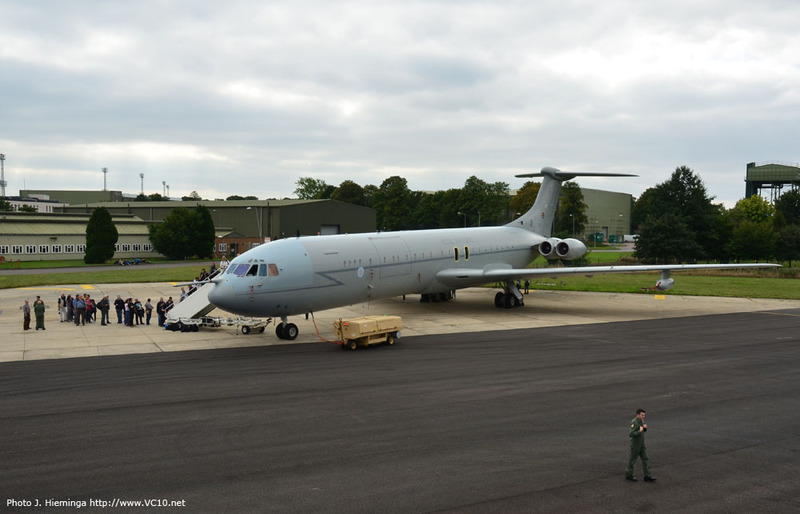 3 September 2013 Returned from last ever VC10 detachment to 1312 flight at RAF Mount Pleasant. 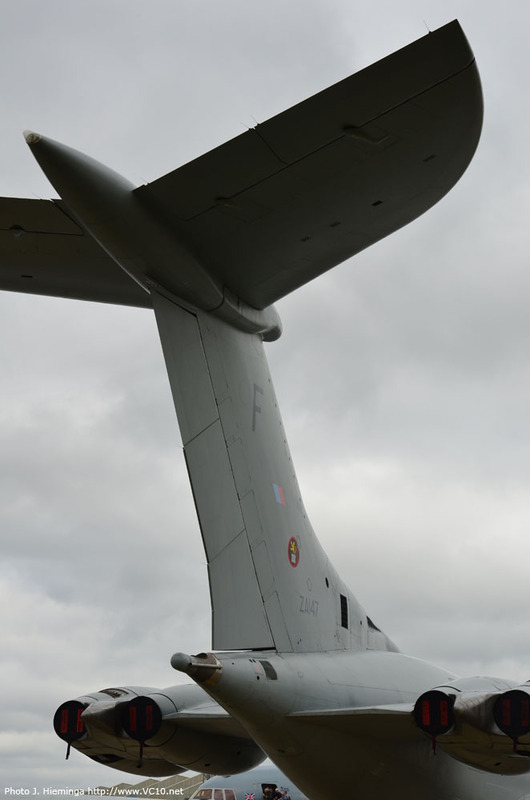 7 September 2013 Took part in the static show at the RAF Leuchars Air Show. 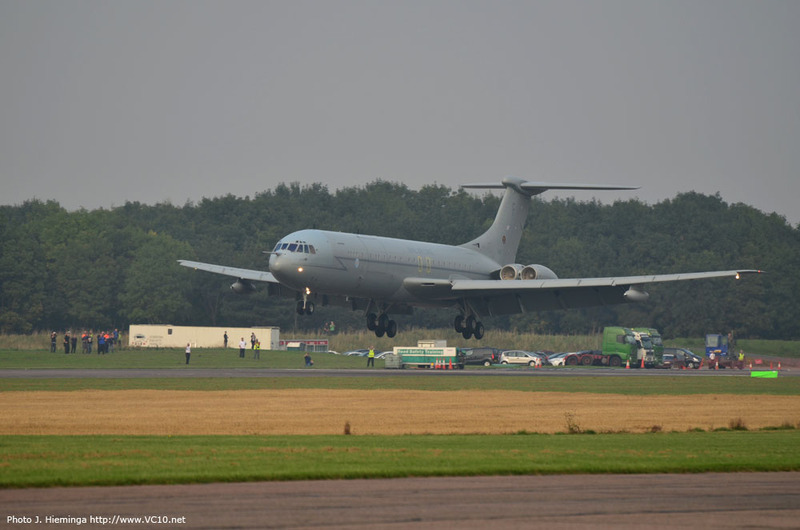 Last ever air show appearance for a VC10. 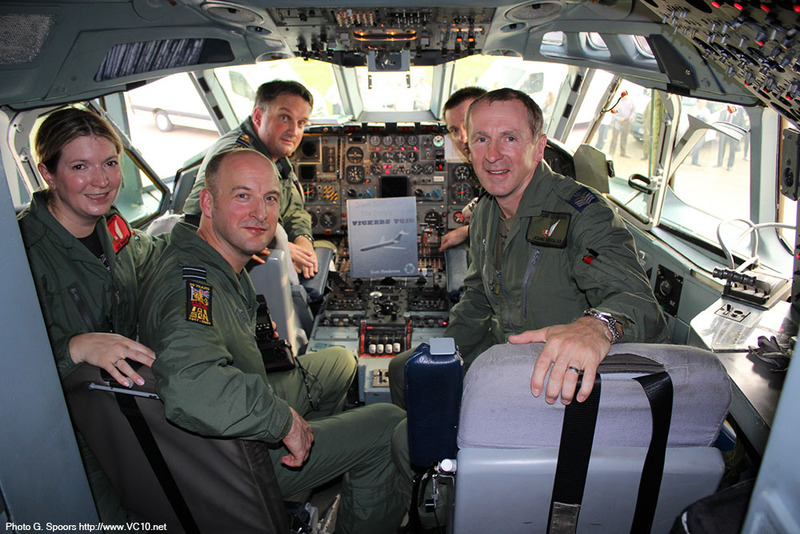 20 September 2013 Flew last operational sortie together with ZA150. Carried out flypasts at Newcastle, Warton, RAF Coningsby, RAF Marham and Birmingham. 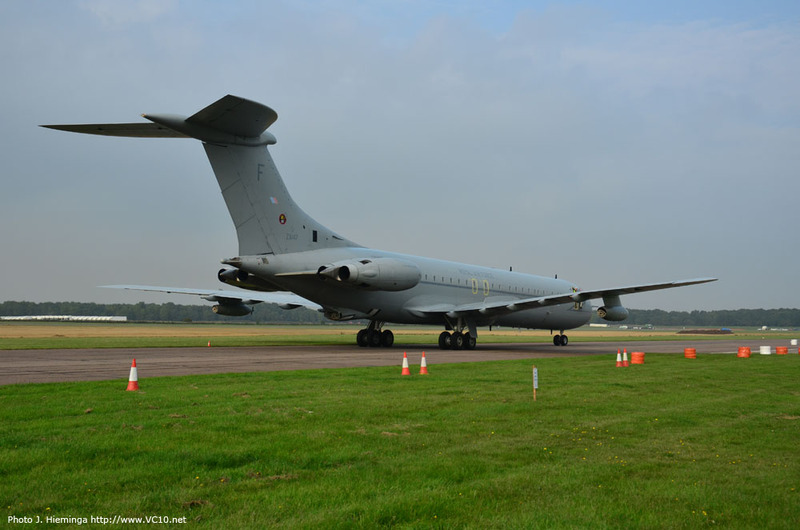 At the end of this sortie ZA147 made the last ever landing of a VC10 at RAF Brize Norton. 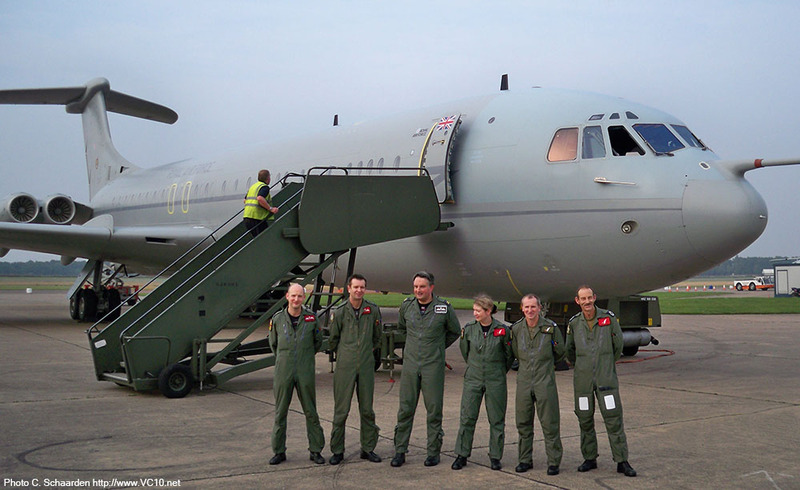 22 September 2013 ZA147 took part in an Aviation Enthusiasts day at RAF Brize Norton, together with Tristar ZE705 and C-130K XV303. 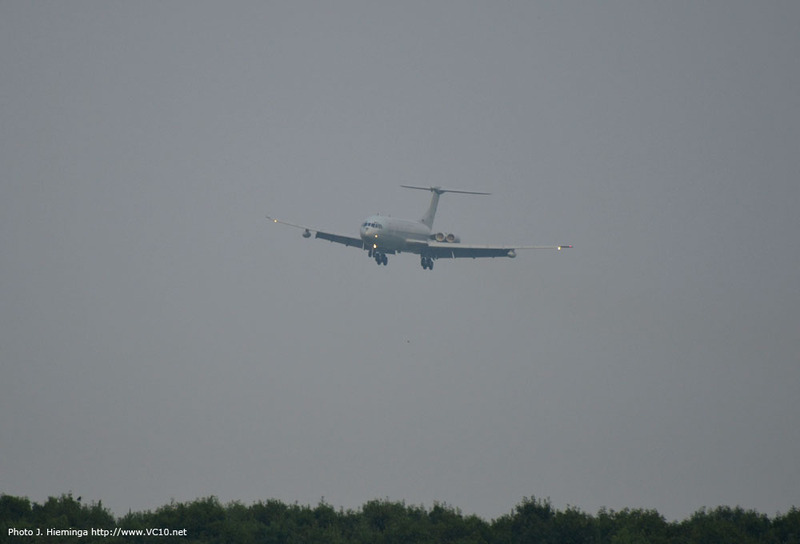 25 September 2013 ZA147 took off from RAF Brize Norton around 14:45, having been delayed by fog. 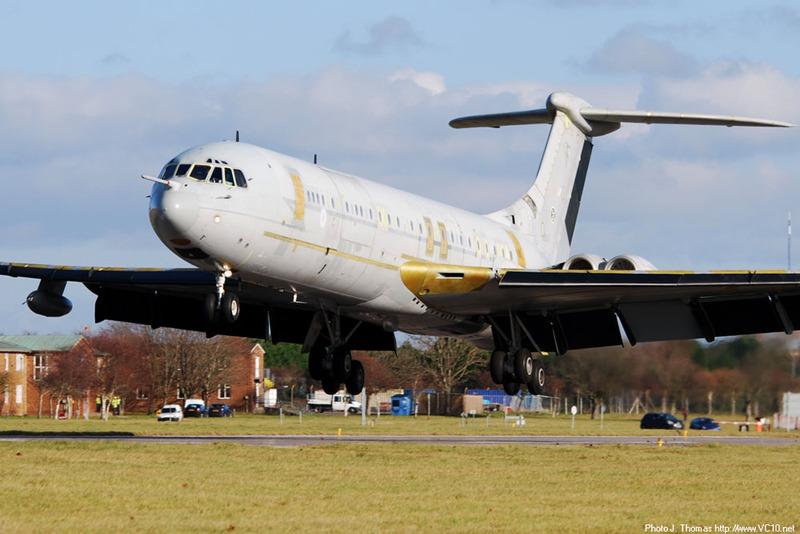 After a flight of around one hour she appeared just North of Bruntingthorpe, performed two go-arounds and landed at 16:02, bringing to a close a superb career of 51 years. 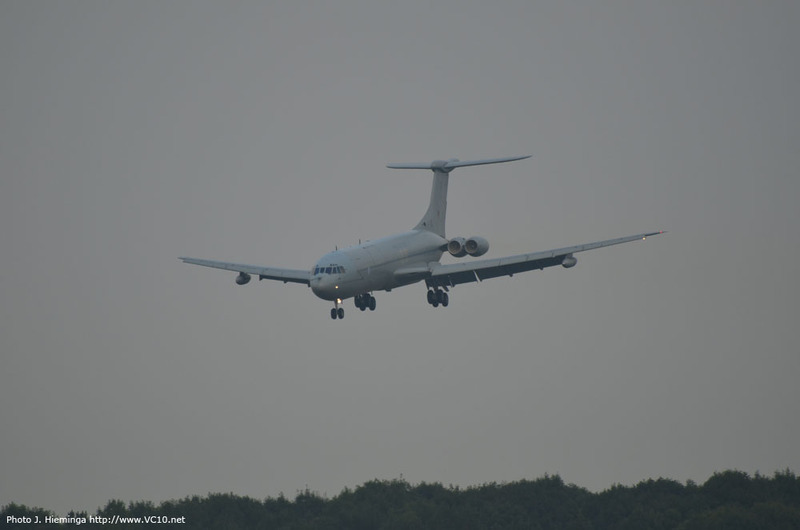 Last ever flight of a Vickers VC10. 1. 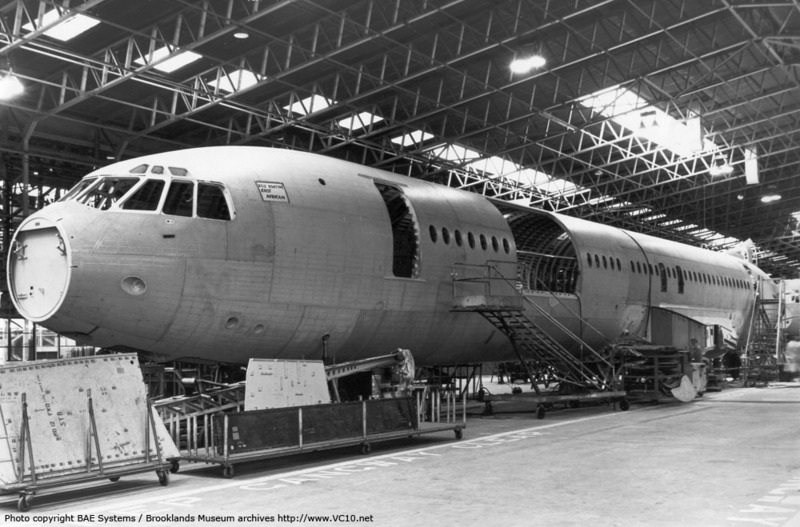 The fuselage of EAA's second Super VC10 seen on the assembly line in the B1 building at Brooklands. 2. 5H-MMT undergoing preparations for its first flight at Brooklands. 3. 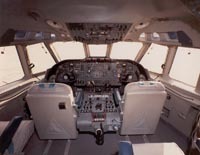 The flight deck of 5H-MMT as delivered by Vickers to EAA. 4. 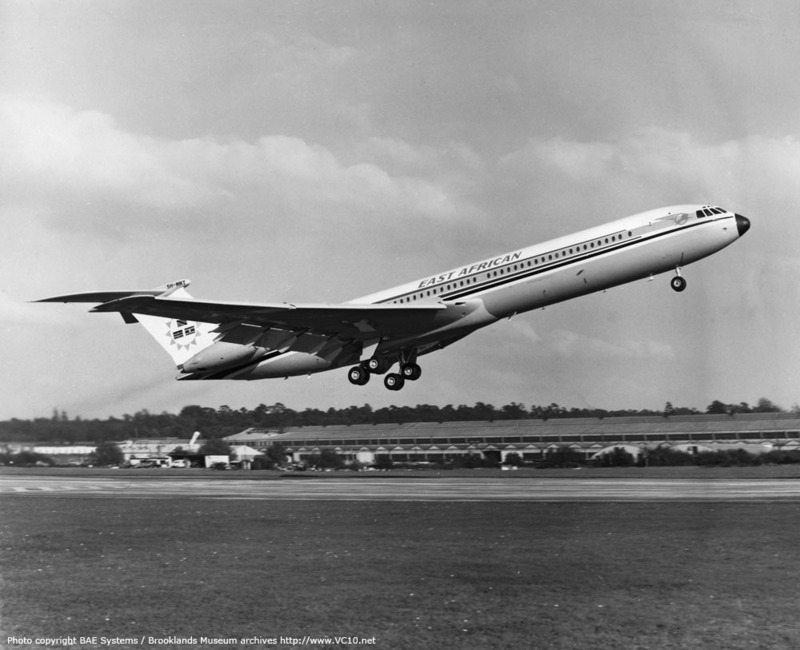 On 12th October 1966 5H-MMT lifted off from Brooklands for its first short flight to Wisley. 1. 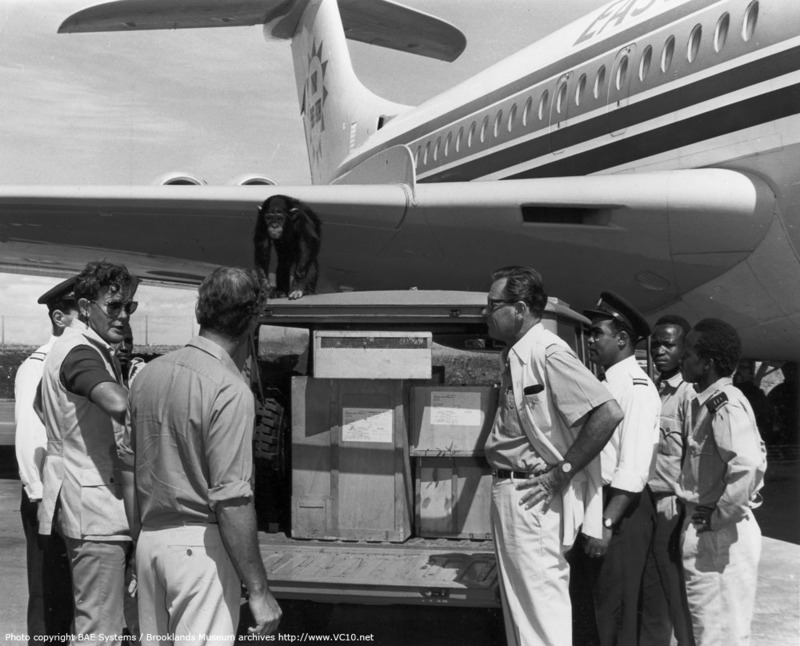 In service with EAA with the local wildlife overseeing the loading. The gentleman on the right with the glasses may be William Holden. 2. Parked next to a Hercules with Concorde development aircraft G-AXDN standing nearby. 3. 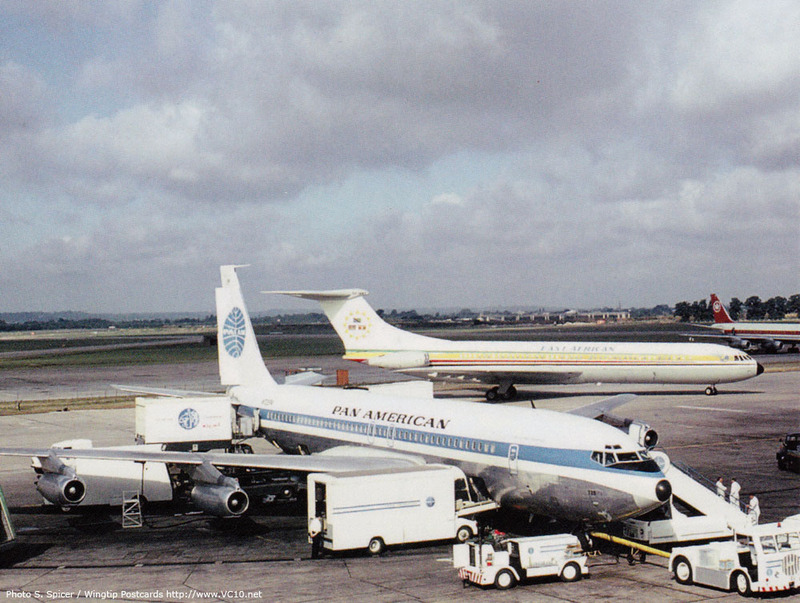 5H-MMT taxies past a parked Pan Am 707. 4. 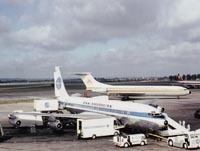 5H-MMT being towed across an airfield with several doors open. 1. Photographed at the gate at London Heathrow in February 1974. 2. After conversion to a K3 tanker the now re-registered ZA147 is seen here in its first colourscheme. 3. 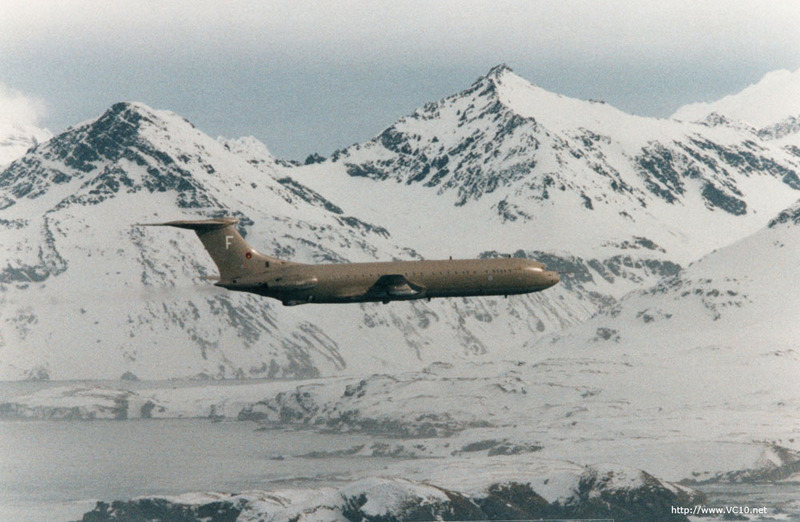 K3 ZA147 flying low over an island in the South Atlantic ocean in 1995. 4. Still in the hemp colourscheme, refuelling a Phantom. 1. ZA147 is seen here in 1999 in the all over grey scheme which replaced the hemp colours. 2-3. 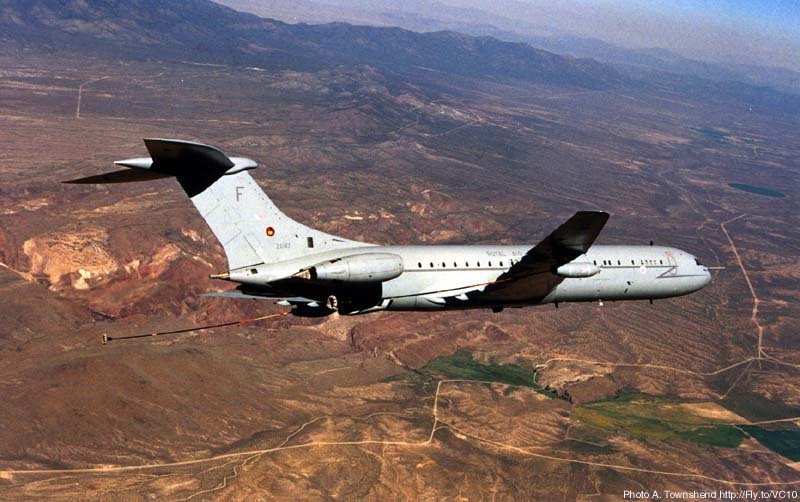 In the same year ZA147 took part in the large Red Flag excersise and is seen here over the Nevada desert. 1. 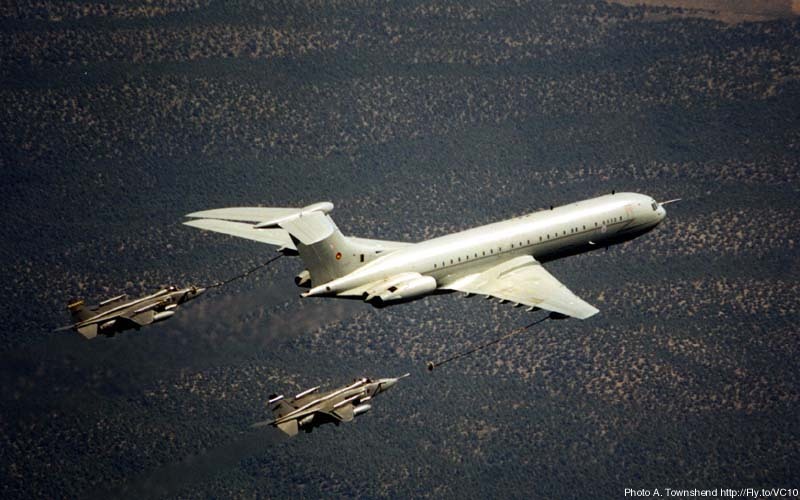 ZA147 refuelling Jaguars during Red Flag 1999. 2. ZA147 seen during a base visit in May 2005. 3. 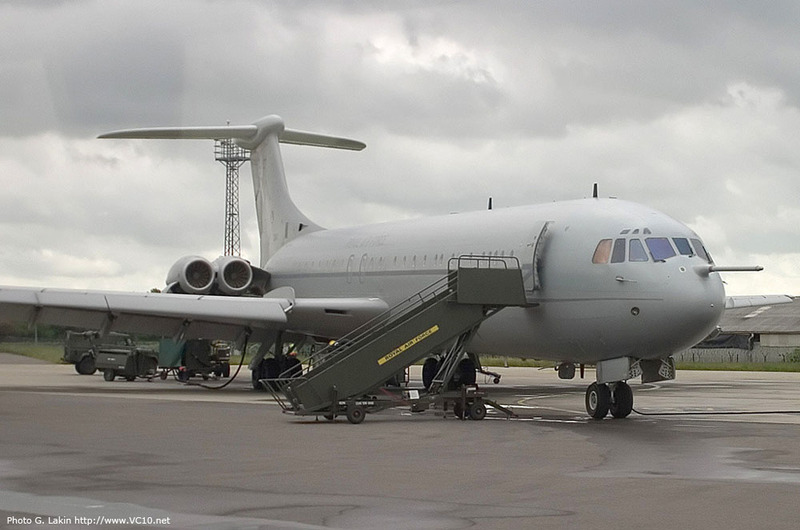 VC10 K3 ZA147 'F' is parked at St. Athan after the completion of the type's last major servicing. 4. 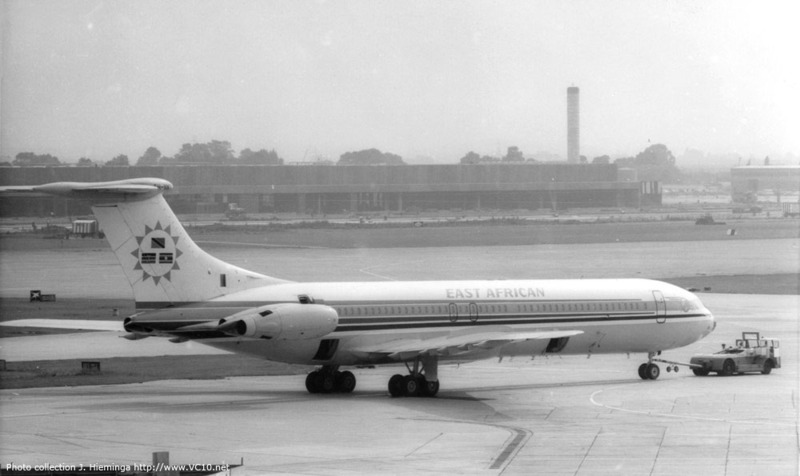 The same aircraft taxiing out for take off during the test flights which were performed after a major servicing. Photo Geoffrey Lee, Planefocus Ltd.
1-2. 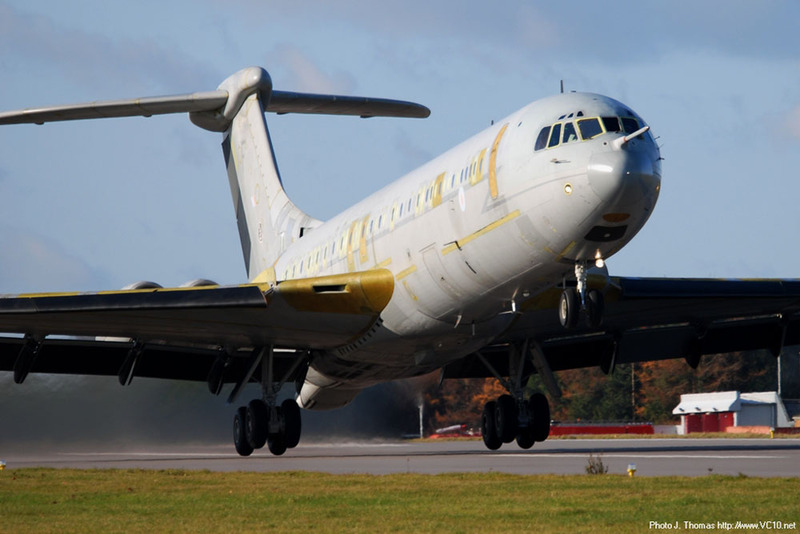 Two more photos of ZA147 during the last two test flights. After completion of the test flights the airframe would be flown to the painter for a new coat of grey. 3. 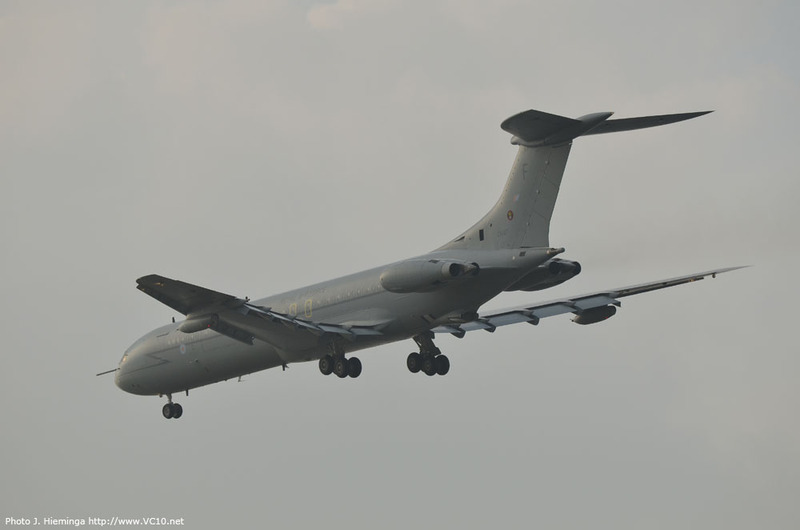 ZA147 climbing away from St. Athan on 25 November 2010. 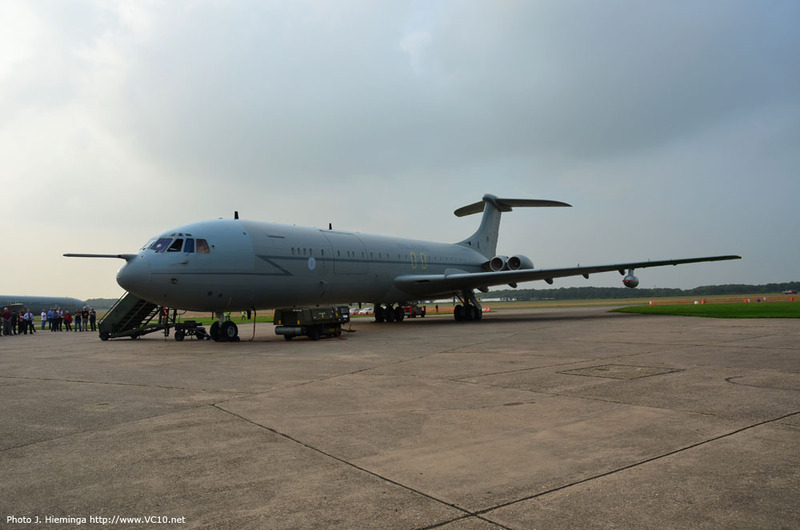 With the last major service completed on this airframe St. Athan would only perform minor service on the VC10 from here on. 4. 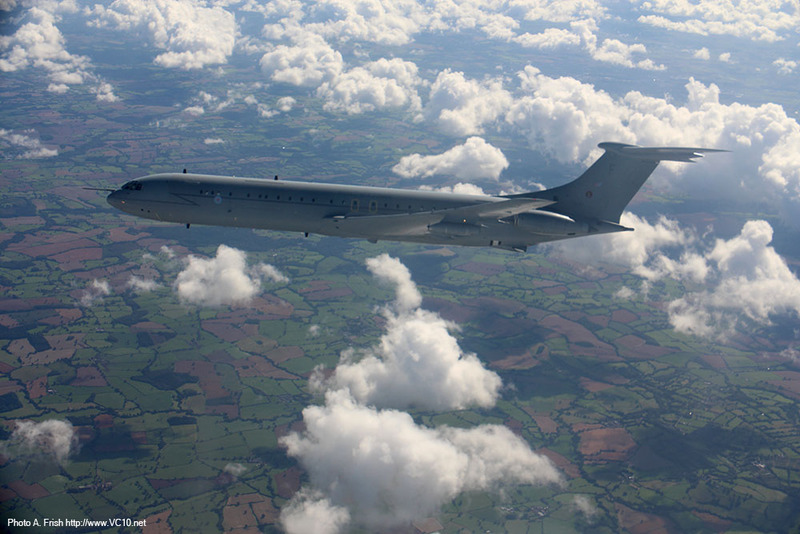 ZA147 flew as no.2 in the special three-ship formation that overflew several RAF stations on 28th August 2012. 1-2. 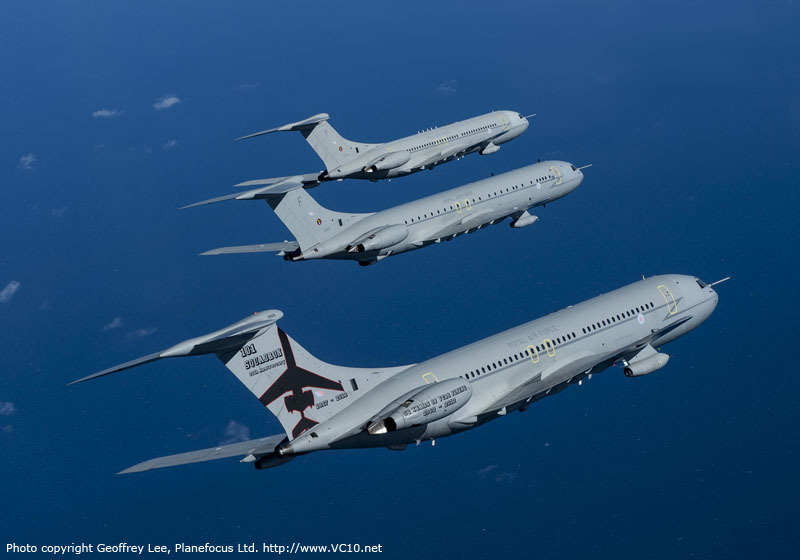 Two air-to-air photos taken during the three-ship formation flight. 3. ZA147 flew as no.2 with XV108 in the lead. 4. On this image, ZA147 hides just off the left wing of XR808. 1-4. 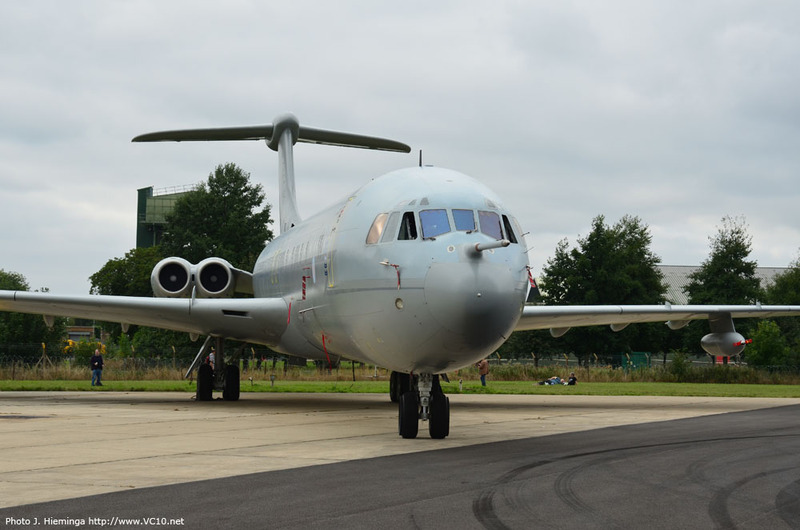 ZA147 during the Aviation Enthusiasts day at Brize on 22 September 2013. 1. 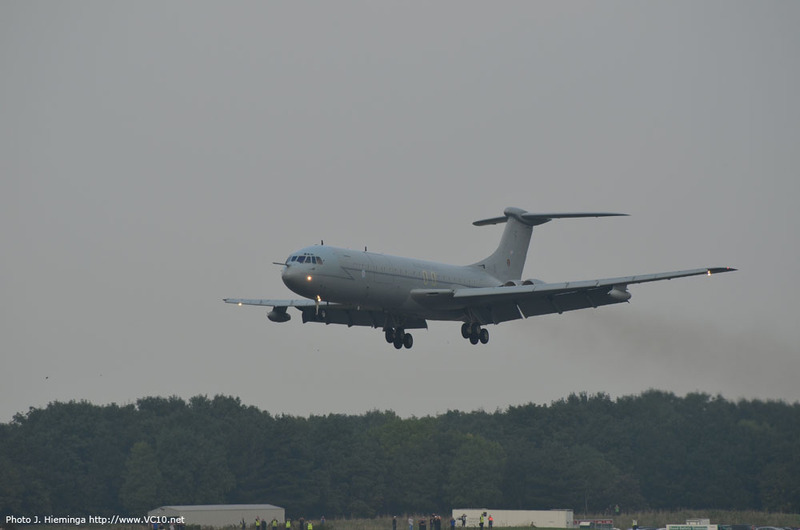 ZA147 turning final at Bruntingthorpe on 25 September 2013. 2. 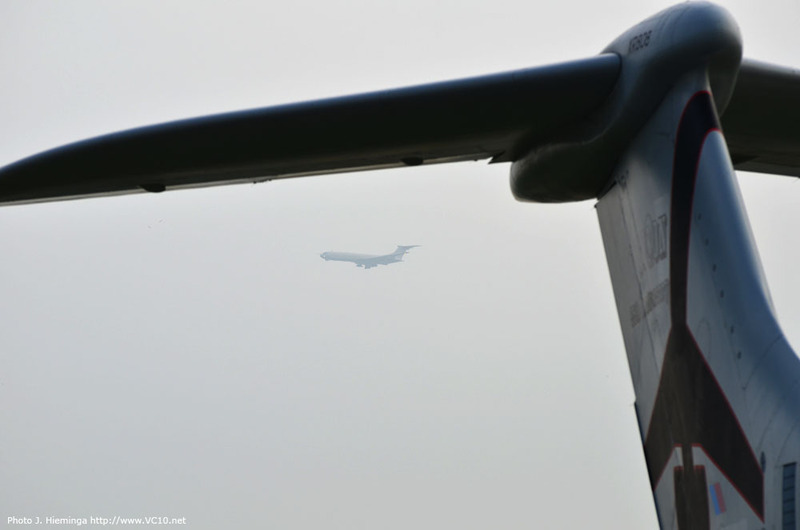 The aircraft has a significant nose down attitude to get itself positioned for the beginning of the runway. 3. Powering up for the first go around. 4. Crossing the airfield with four Conways at full song. 1. This was the first of two go-arounds. 2. 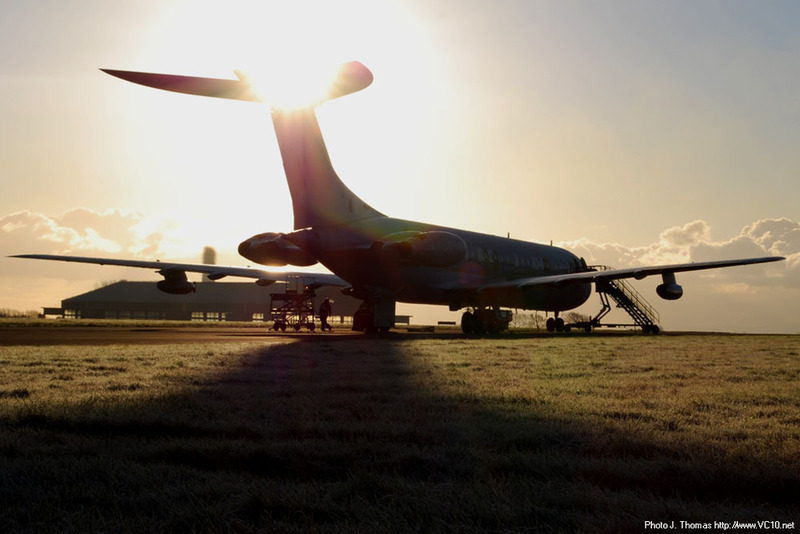 Gear doors opening and the sun shining on ZA147. 3. ZA147 framed by XR808's tail while on downwind to land. 4. Turning final one last time. 3. And the main gear is down for the last time. 4. Rolling out along the runway with crows scattering. 1. ZA147 taxiing in past ZD241 and ZA149 which are sitting engineless. 3. And once parked on the pan the Conways are shut down. 4. ZA147 at the closing of an era. 1-2. 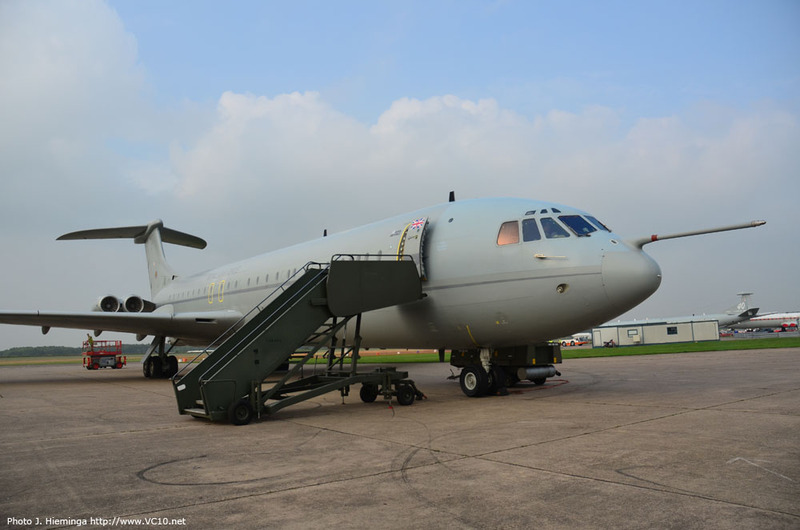 The crew that operated the final VC10 flight consisted of Cat Thompson, Paul Smith, Steve Lushington, Trev Colley, John Douglas and Jules Rolfe. 3. 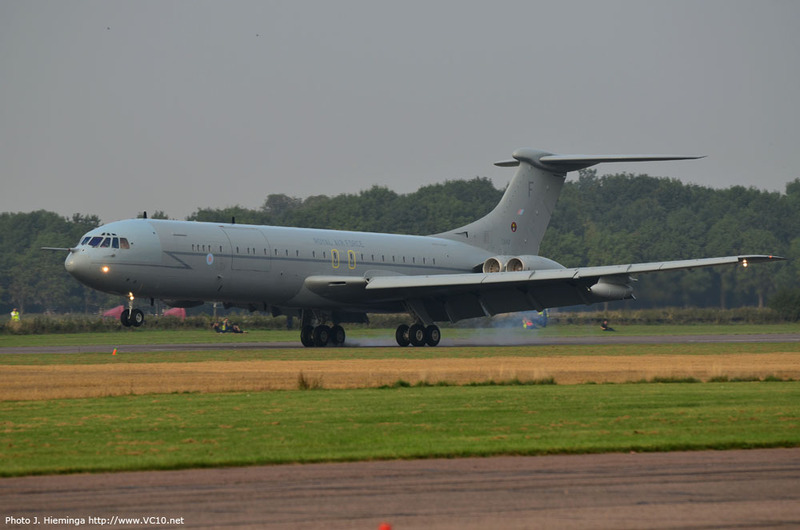 Seen here in 2015, both ZA147 and ZD241 are at Bruntingthorpe. 4. 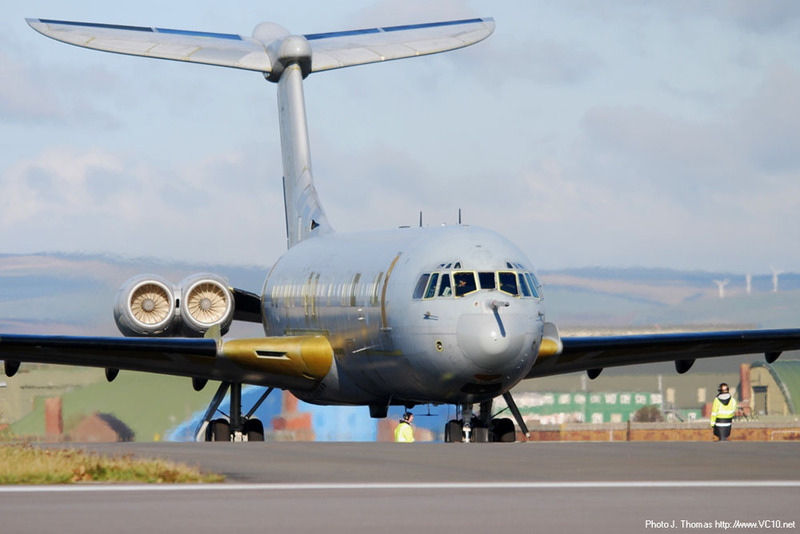 Although some parts, including the engines, have been removed, ZA147 is looked after and safely stored. 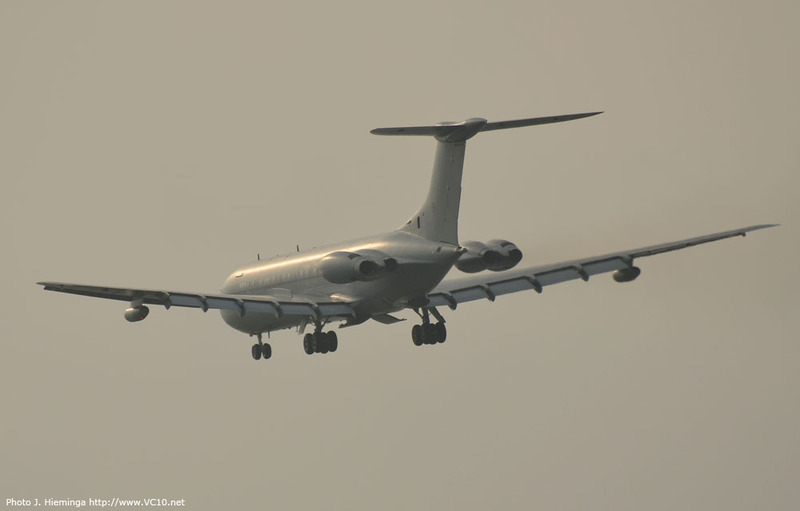 The Vickers VC 10 - End of an Era from Simply Planes - Official on Vimeo, Copyright Chris Cannon - Simplyplanes.co.uk.